From the winter of 2006 through the spring of 2007, two-hundred-fifty Marines from Echo Company, Second Battalion, Fourth Marines fought daily in the dangerous, dense city streets of Ramadi, Iraq during the Multi-National Forces Surge ordered by President George W. Bush. The Marines’ mission: to kill or capture Anti-Iraqi Forces. Their experience: like being in Hell. 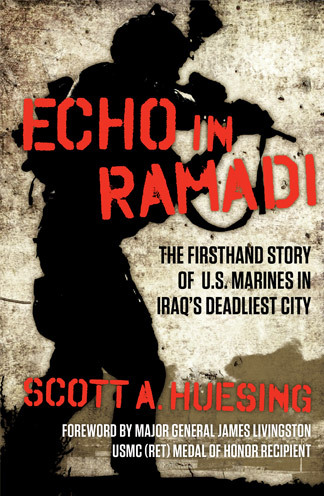 Major Scott A. Huesing, the commander who led Echo Company through Ramadi, takes readers back to the streets of Ramadi in a visceral, gripping portrayal of modern urban combat. Bound together by brotherhood, honor, and the horror they faced, Echo’s Marines battled day-to-day in a totally different kind of war—a war without rules, built on chaos where the frontline was everywhere. In Echo in Ramadi, Huesing brings these resilient, resolute young men to life and shows how the savagery of urban combat left indelible scars on their bodies, psyches, and souls. Destined to stand with classics like; We Were Soldiers, The Yellow Birds, and Generation Kill, Echo in Ramadi is an unforgettable experience of war that will leave readers stunned. Scott A. Huesing is a retired United States Marine Corps Infantry Major with 24 years of honorable service, both enlisted and as a commissioned officer. 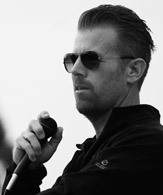 During his career spanning 10 deployments, he operated in over 60 countries worldwide. Throughout his numerous deployments to Iraq, Afghanistan, and the Horn of Africa he planned, led, and conducted hundreds of combat missions under some of the most austere and challenging conditions. Scott lives in Southern California with his family. Scott is the Executive Director for Save the Brave Foundation, a certified 501c3 that connects Veterans through outreach to build strength of character – their mission is staying proactive to the needs of the Veterans they serve. He is the President of the 2d Battalion, 4th Marines Association, a non-profit that helps Veterans and active duty Marines. He is a member of Bravo 748, a combat speaker consortium founded by Gold Star mother, Jamie Burton.